Actor Amy Smart (Varsity Blues (1999), Road Trip (2000), The Butterfly Effect (2004), Just Friends (2005), Mirrors (2008), The Single Moms Club (2014)) divides her time between Los Angeles and Traverse City—where she and her husband, HGTV star Carter Oosterhouse, co-own Bonobo Winery. Smart’s new movie, Sister Cities, is making its world premiere at the Traverse City Film Festival on Friday. We checked in with Smart, who incidentally is the August 2016 Traverse Magazine cover girl (on newsstands now), about TCFF, where to meet up with her for a Q&A and where to eat and drink before and after her movie. Amy and Carter got married in Northern Michigan! Read about their eco-friendly wedding on Old Mission Peninsula in Traverse City. The World Premiere of your film, Sister Cities is Friday, July 29, (6 p.m., Lars Hockstad Auditorium) at the Traverse City Film Festival. Tell us about how that came to be? I shot Sister Cites last summer in LA and early this spring I spoke with the director and producer and asked what the update was on the film. They knew about the TTCF and always loved the idea of having a film in it. They thought it would be a perfect place to premiere it so I connected them to Deb Lake, and we were fortunate that Michael Moore liked the movie. Any chance that the audience will be treated to a personal meet and greet with you? I’ll be there for the premiere and we will have a Q&A after at the theater. We are also going to invite whomever wants to come. We are going to be offering specially priced glasses of Bonobo wine at the Hotel Indigo after from 8:30 to 9:30 p.m. for a meet and greet with the cast and crew. Will any of your co-stars be in town for the premiere? No, but we will have the director, two producers and the writer. Sister Cities is about four estranged sisters who gather for their mother’s funeral. You play the part of the mother, Mary, when she was younger. It sounds like a complicated role. Can you share your takeaway? Mary, in her younger years, was a very vivacious, happy person who traveled on a whim to follow her new lovers. Hence, she named all four of her daughters after different cities where she had them. She was a professional dancer and really lived in the moment not considering the consequences of her actions. The movie is at 6 p.m. – sounds like a late-lunch/early dinner is in order. Where in Traverse City would you recommend eating before the show? 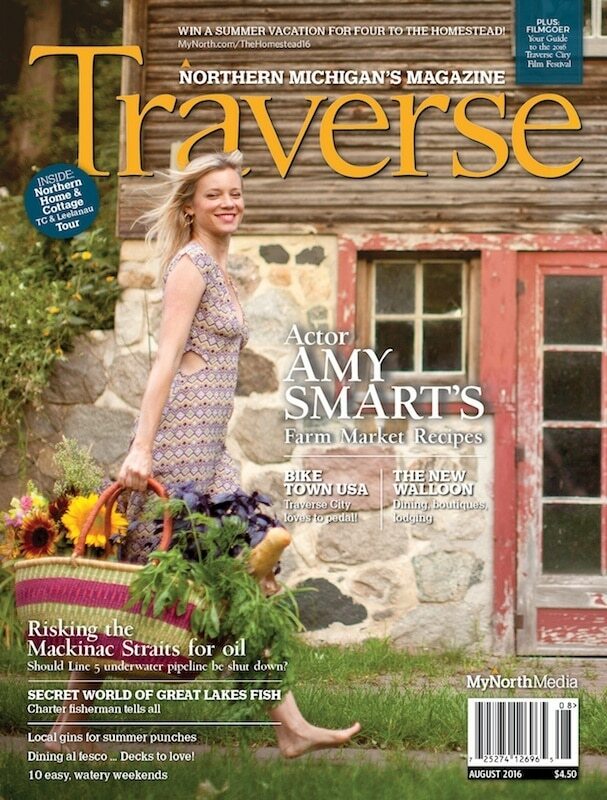 Top off this all-Amy Smart evening with small plates at Alliance and a glass of Bonobo wine with Smart and the movie’s cast and crew at Hotel Indigo from 8:30 to 9:30 p.m.
Get the August issue of Traverse, Northern Michigan’s Magazine on stands now!